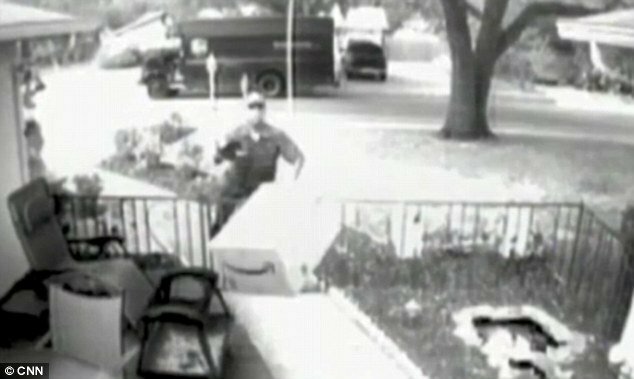 More FedEx and other companies delivery men caught on camera making "special deliveries"
The video of a FedEx employee lobbing a computer monitor into a garden has been viewed 200,000 times on YouTube and seemed to be hilarious, but, sadly, this isn’t the only box not being handled with care. Other delivery men have been caught in the act of throwing, dragging and dumping special deliveries in the U.S.
A whole range of techniques are employed by the busy delivery guys. One man throws packages from his van without even looking where they are going to land. Another has perfected a horseshoe throw while one uses as much care as you would to toss out the garbage. In another incredible clip, a FedEx truck on the highway was caught on video camera with what appears to be a kitchen appliance stuck to the front grille – with sparks flying up from the road. Shea Leordeanu said company executives were “shocked” when they saw the video yesterday and called the handling of the package “unacceptable”. Taking the package out, he walks alongside an iron gate and past what appears to be a security keypad that might buzz him in. “All of us here at FedEx have seen the video and quite frankly we were shocked,” said Shea Leordeanu. The customer who posted the video has not contacted the company yet, Shea Leordeanu said. However, FedEx officials asked the person to come forward so they could properly apologize.